Checking in at a monastery mean checking out of being "connected"
Seventeen Augsburg College students bit the bullet at year’s end and gave up all their electronic gadgets for a week. Their goal was to experience the contemplative life at a functioning monastery. Their professor, Medieval History specialist Phil Adamo, led the group to rural Scotland for an immersion at Pluscarden Abbey, a community of 30 Roman Catholic monks. It was a completely different world for the students from Augsburg. What they encountered was a disciplined group of men who wear white robes and keep their heads hooded. They pray and worship in Latin. They eat in silence. Where did “The Hours” go? Amber Kalina, a third-year youth and family ministry major from Perham, Minnesota, was struck by the daily disciplines at Pluscarden, and impressed by the fact that she and her fellow students from Minnesota could fully participate in the daily rhythm of the monastery. the Pluscarden Abbey in rural Scotland. What they encountered was a disciplined group of men who wear white robes and keep their heads hooded. 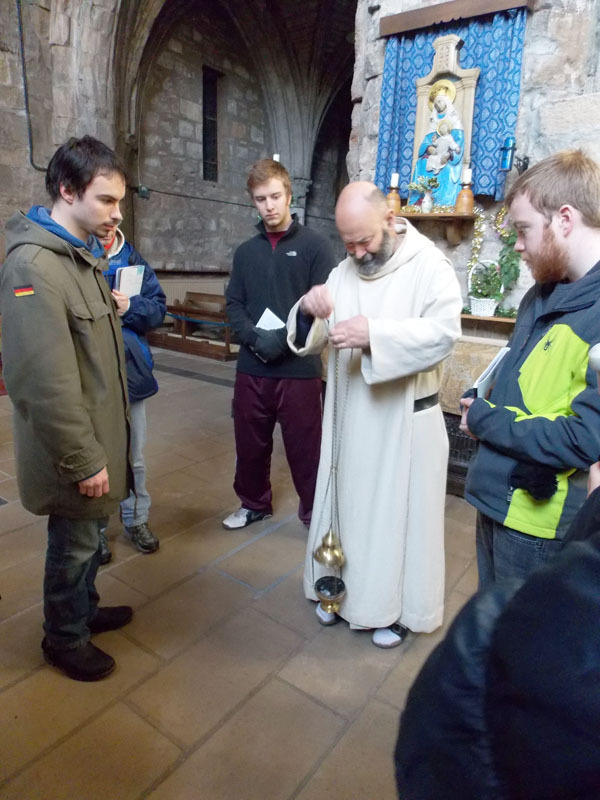 While Adamo has visited the monastery four times, this is the fourth second year he has taken a group of his students to Scotland to experience life in a monastery. Pluscarden Abbey, he explains, was founded in the 1200s by monks known as Caulites. “I have been studying the Caulite order for the last 20 years,” he says, adding, “I’ve become the world’s leading expert on them.” That explains his interest in having his students visit Pluscarden. 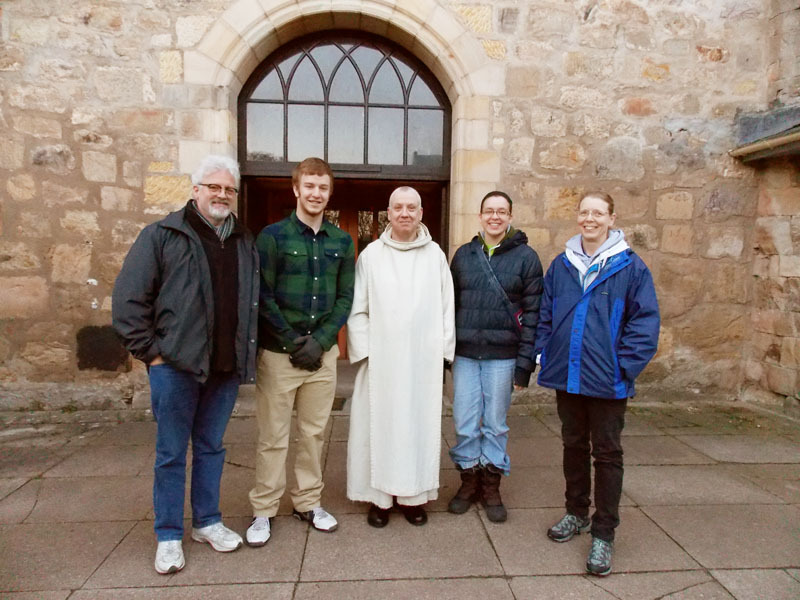 Father Giles, a monk at Pluscarden Abbey, shows the Chapter Room to Augsburg College students (left to right) Julie Fedeler, Amber Kalina, Matt Current, and John West. 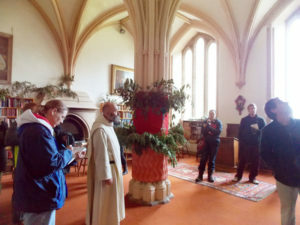 The Chapter Room is basically where the monks meet, so-called because a chapter from the Rule of Saint Benedict is read at the start of each meeting. Those are impressive words, coming from a guy who wants to become an engineer. And, no doubt, it’s also an affirmation of Augsburg’s commitment to maintain its identity as a college of the church. UPDATED January 24,2014: An earlier version of this article incorrectly stated that Adamo has taken four groups of Augsburg students to Pluscarden. This was actually his second class to visit the monastery.